Discussion in 'Google TV General Discussion' started by JimMariner, Oct 19, 2010. 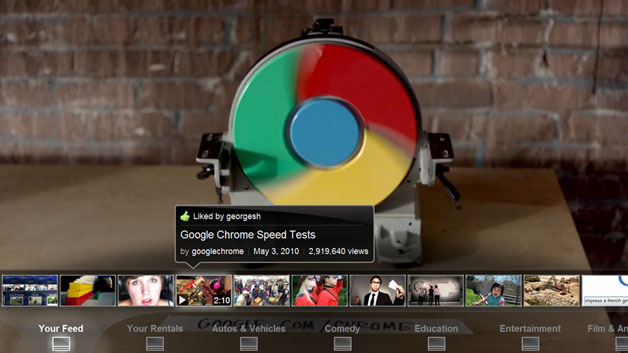 Google has integrated its YouTube Leanback service with its upcoming Google TV product ahead of its launch this weekend. The search giant's YouTube Leanback, which was demoed during the Google I/O conference in May this year, is designed to allow users to watch online videos on YouTube in a playlist format. According to Google, Leanback is designed to allow a simplified YouTube experience, bringing easy navigation options, advanced search capabilities and an enhanced UI for browsing videos. The service is programmed to start playing YouTube videos based on the user's interest and other subscriptions, tech news site The Inquirer reports. Leanback users will be able to access the full catalogue of YouTube videos straight from their TV sets through 10 separate channels showing popular videos from a range of different genres. The service is set to be updated daily. You can also watch full-length movies and TV shows rented from youtube.com in the highest quality, Google said.